The running temperatures are dropping. The kids are back in school. Football has started, and the leaves in the neighborhood have not quite started to turn shades of orange and yellow. The summer race season is behind us. A good time for SeekingBostonMarathon's summer recap. I had three goals I set in January; Qualify for Boston, Improve my Triathlon Game, and Qualify for the NYC Marathon. I guess two out of three ain't bad. The name of my blog is "Seeking Boston Marathon." Ironically, I'm writing this on the first week of registration for the most elusive race in the land--the Boston Marathon. I ran my first marathon naively thinking I would try and qualify for Boston in my first race. I hated the sport somewhere around mile 18 in my first ever marathon in San Diego and swore I would never run one again . Begin the addiction. My next one will be my tenth. I qualified to run Boston again in 2012 to try and run my third in a row. With the explosion of the sport and the BAA wanting to compete with New York and make it even more desirable, they "raised the bar" in 2012 and even higher in 2013. You had to run faster. I did NOT get in Boston in 2012 to run my third after running 2010 and 2011. I set the goal to get back by qualifying this year. Ironically, I targetted the race I always wanted to do, but it was too close to Boston--the Colorado Marathon in Ft. Collins, Colorado. My college home town. With a new job and a lot of day-to-day life constraints, I opted to use the Furman, "Run Less, Run Faster" program which had three aggressive runs a week with a complement of cross-training. Since 2011 seemed to be marked with injury and overtraining, it seemed like a smart choice especially as I'd build up my swim and bike as part of the cross-training. 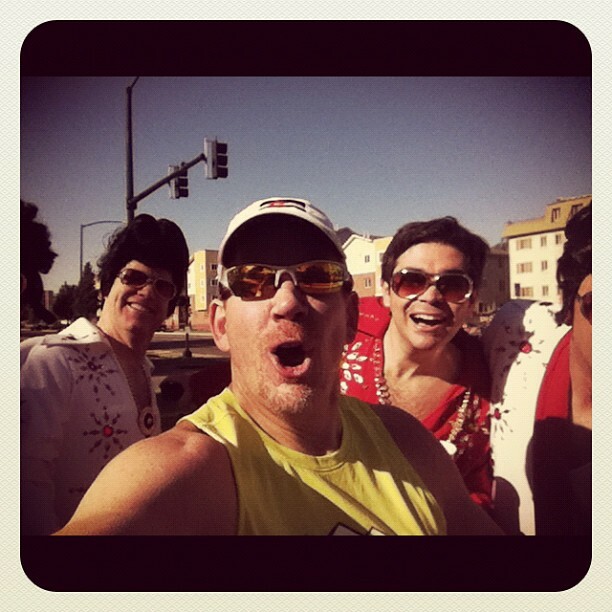 Before jumping into the triathlon season, I paced a race at the Colfax Marathon. I paced the 2:45 half marathon group. Some of my DailyMile friends mistakingly thought I had paced the 2:45 full. Um...no. Regardlless, it's no doubt one of those bucket list items as a runner to "give back to the sport." I thoroughly enjoyed it as my pictures with Elvis are evidence--the first time I'd ever stopped in a race to take a picture. My half pace experience story is here. 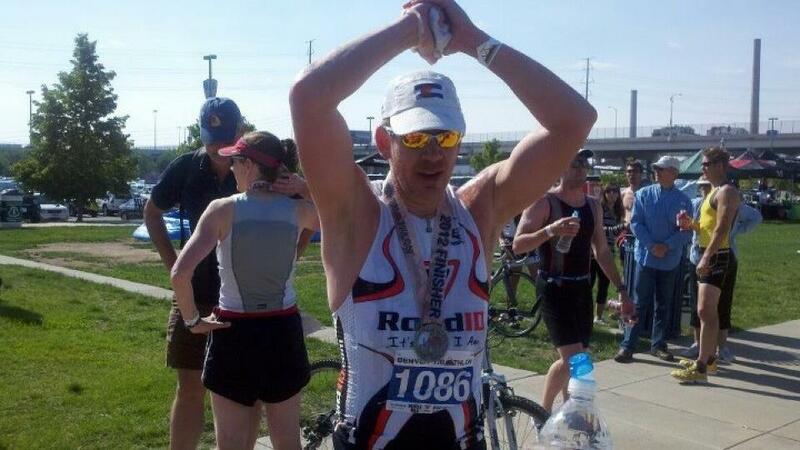 After Colorado, I switched gears to focus on my triathlon game. With a birthday and new age ending in a zero, I'd moved up to a new age group so I was anxious to see what I could do in the sport that I'd started only last summer. I had four sprint triathlons over the summer (seems to be the distance I am good at and enjoy) and was able to take first place in my age group in three of the four races. A "hat trick." My next two tris would pit "Father vs. Son" in races that I got to enjoy with my youngest son. He's only 13, but is on the DU Hilltoppers Swim team and looks like he's 15. 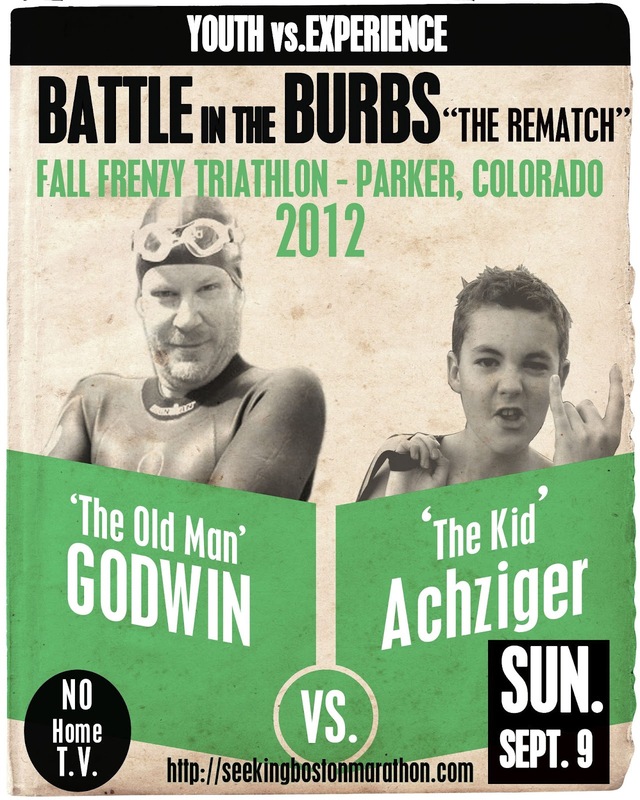 He has a brilliant future in triathlons and swimming and is likely within months of eclipsing dad in the sport. I'm okay with that. I'm even more okay with the tri from this last weekend where we both placed first in our age group at the Parker, Colorado "Fall Frenzy." The Fall Frenzy was a "repeat" as was the Highland Ranch Splash Mash and Dash races I did last year. My swim in the Frenzy was disappointing as I struggled with my pace and for the first time, I had water fill my goggles in a race. I had to stop to empty and reseal them on my face--rookie mistake. After the slower (compared to last year) swim, I was determined to push myself on the bike leg. I have been trying to "break" the 20 MPH barrier in a race and posted my fastest ever time of 19.9 MPH. My only disappointments of the summer were dropping out of the Georgetown to Idaho Springs Half Marathon, and subsequently not going for a PR and potential NYQ (New York Marathon Qualifier.) Stomach issues, stress, travel and fundamentally not trained to go out and try and run a PR race lead to the difficult decision. After a three year battle (quite literally,) I've closed the chapter on a lawsuit I've been fighting that had taken quite a toll on me and my family. I'd have to rank this much higher than going through a divorce which was no picnic either. No doubt this raised my stress levels and likely lead to a lot of the stomach issues I was dealing with. Papers have been signed to put this in the "rear view mirror" and that's where I will leave it--behind me. My oldest child (who's no longer a child) has entered her senior year in high school and was voted Sr. Captain of her Poms team. Overall, I'd have to say looking in the rear view mirror, it was a great summer. With my family and another race season around the corner, I have much to look forward looking out the windshield. A footnote: My running group lost a member this summer, Michael Fontes. We continue to think of you and we are still saddened by your loss doing something that you loved.